Booster Gold laments his circumstances - trapped in a future he finds distasteful and lacking the benefit of his pilfered super-gadgetry. Skeets, for his part, is a bit dejected - he's beginning to think that Booster sees him as little more than a gadget. But Booster doesn't want to talk about it: there's a conflict that needs sorting out and off he goes, jumping from a rooftop to the ground below and asking Skeets to manage the anti-gravity tech that controls his descent. On the street, agents of EarthGov are pursuing an alien - a "xeno," as they put it - a young girl crying out in "Dumakan" for somebody to save her. Booster intervenes and the EarthGov agents are undeterred by the girl's age - "Filthy xeno is a filthy xeno," one says. Skeets disagrees with Booster that they've "got this." But Booster puts up a good fight until he and Skeets are electrocuted and subdued. Meanwhile, Clark and Kara are flying over the Amazon, talking about the situation. Clark thinks New Krypton has a right to Faora's remains and Kara decides she's no longer going to be a soldier. They hold hands and Clark talks about how "it took the world almost ending" for him to embrace his destiny and become Superman. He hopes he can help Kara sort out her "issues" before Earth is destroyed "again." As they begin to approach their destination, Kara is hit with some kind of energy blast. EarthGov aircraft have arrived and demand that the two of them stand down. Superman says no, and the fight begins. Just then, it ends as Supergirl vision-blasts one of the two aircraft out of the sky and she and Superman have to save the pilots from certain death. The pilots, completely ungrateful and unimpressed, immediately begin shooting at the two heroes but Superman puts a final end to the kerfuffle with his "Arctic" breath. Next stop: Zod's Kryptonian fortress, deep in the Amazon, where Faora's body lies at rest entombed in crystal at the bottom of pit located in the center of Zod's throne room. Then Kara finds a cartridge from a "DNA extraction device." What, they wonder, could EarthGov want with DNA from Faora's unborn child? At EarthGov, scientists reporting to Minister Niedrigh exclaim that they have "successfully integrated the child's genetic material into Subject Zero." Niedrigh is exultant, convinced they've made history and that "the xenos will be undone by a weapon of their own design." Story - 3: Oh goody, expository dialogue! My favorite! Zod built himself a fortress in the Amazon??? Come on. This is the kind of goofy "up the stakes" retconny stuff that gives comic books a bad name. What need is there for this? Weren't those twin towers supposed to be Zod's fortress, so why not just make a connection back to that instead of this all-new location? When did he have time to build it and entomb Faora there? Are we supposed to just accept it as more Kryptonian auto-construction? Say we allow that (and fair enough): why doesn't it look like Clark's fortress? On the contrary, it's completely different, suggesting that it took a bit more doing than simply tossing a crystal into the snow. See, my recollection of the end of Season 9 was that it all happened very quickly, and I just don't buy that the Zod we were seeing in those final episodes would have been so sentimental about Faora's death that he would have spent much of that time building this place. I could keep going with the questions. Ultimately, it appears to be a (probably) calculated risk to enable the (let's admit it, fake scientific) exploration of the idea that a Kryptonian conceived and born under the yellow sun of Earth would be extra special in some way. I'm happy to take this ride, but boy, we're starting out pretty bumpily, so let's watch the road, huh? Admittedly, the reveal of "classic" Doomsday (i.e., all suited and begoggled) at the end is intriguing, though I feel I must point out that it probably also qualifies as a retcon - this, in other words, because of the design reference, is the "real" Doomsday and Davis Bloome was but an obscure, failed first attempt. Of course we'd never heard of him before. No, better: Clark himself didn't even know how he survived the final battle, right? Maybe they were already in The Matrix at that point! Oh man, I think I just blew my own mind. But seriously, I'm ok with seeing a Doomsday. Lord knows he's not a singular being (in pre-Flashpoint continuity anyway), and anyway he's one of my favorite Superman "villains." I don't see the need to make him look like he did in his original first appearance, for even in comic book form it still feels curiously like the televised fan service to which we were so often subjected. That's probably because of the pattern of fan service on the show, but nobody forced them to continue the show in comic book form. Otherwise, technically, the plotting is well done here, even if the dialogue occasionally grates. I'm also thinking it would be cool to see Booster's predicament explored more fully in one of the parallel arcs, because as it is he's still being relegated to two-dimensional second-stringer, even as the true force of both his humanity and his heroism is clearly yearning to burst free. Art - 3: What was that small panel where Superman says, "Destiny!" 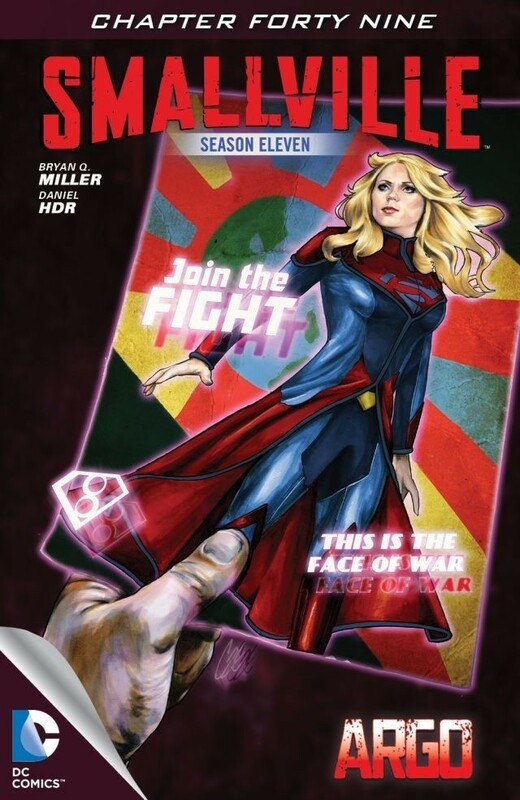 with his arms outstretched like a flamboyant magician and a big simpering grin on his face while Supergirl does the classic little hand-to-mouth tee-hee gesture? I'll tell you what it was: way too frigging much. It looks like something out of Aladdin, which personally I could do without - unless it's supposed to be Clark being flamboyant, which he never is. And actually, there's a lot of goofiness in the poses HDR puts especially Supergirl in this issue, and that drags things down.